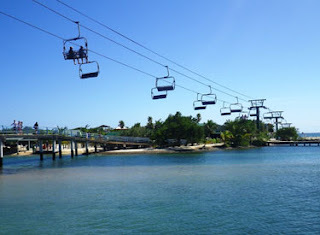 In recent years cruise ships in the Western Caribbean have begun docking at Roatan, an island about 30 miles off the northern coast of mainland Honduras. It may not have the exotic cache of Belize or Cozumel, but it’s every bit as fine a place to spend a day. Turquoise waters, emerald green hills, and sparkling white beaches provide plenty of natural attractions for today’s tourists. During our mid-winter cruise from Galveston on the Crown Princess, we looked forward to sampling this new-to-us port. We chose to snorkel there and weren’t disappointed. 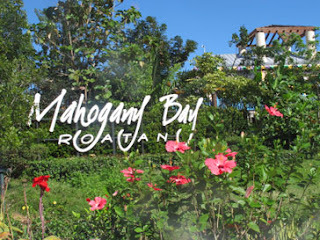 Roatan is surrounded by a barrier reef that lies approximately 300 feet from the shoreline. 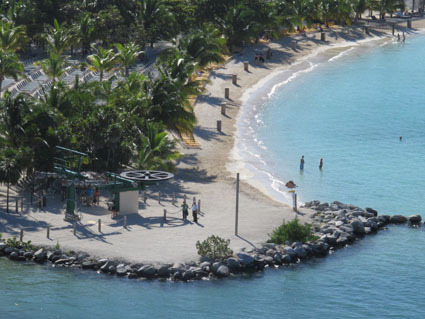 More than 130 accessible dive sites make the island a diver’s or snorkeler’s paradise. An underwater museum of sunken treasures, shipwrecks, and Mayan artifacts offers additional spots to scout for fish. Near the dock, the Magic Flying Beach Chair will take visitors on a cable car ride 1,200 feet above the canopy of trees to Mahogany Beach, a 10-acre private island featuring 825-foot long white-sand beach. We were scheduled on a Jolly Roger catamaran that was docked at Mahogany Bay, but since it was only a short distance from the ship, we chose to walk. 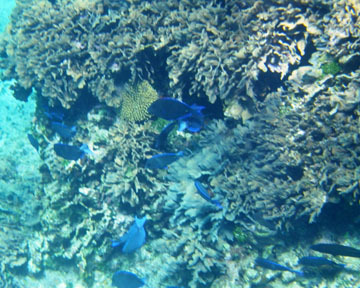 In many places the reef crest is very shallow, just a foot underwater, but our excursion went to deeper water which allowed for extended exploration around a variety of coral species. A school of small blue fish swam by as well as many individual fish. This was my first opportunity to try out a new waterproof camera case, and I was relieved that it worked very well. After snorkeling in the warm water (temperature varies from 78 to 84 degrees), lunch was served: roasted chicken, pasta, cabbage salad, rice—and rum punch, of course. The largest of the Bay Islands, Roatan is 37 miles long and less than five miles wide at its broadest point. 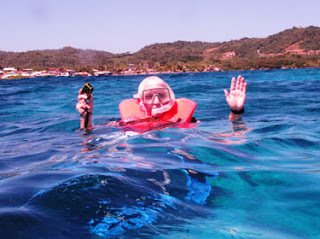 English is the main language, which is another selling point for visiting Roatan. A colorful history full of pirates, Indians, English settlers, descendants of African slaves, and Spanish conquerors makes for a very diverse population. Treasure hunters still come looking for bounty stashed on the island by more than 5,000 pirates during the 16th and 17th centuries. Larry has this snorkeling thing down pat. In 1797 the British defeated the Black Carib tribe for control of St Vincent Island and deported many of the native Indians to Roatan. That was the beginning of the island’s rich Garifuna heritage that descendents in tribal villages still maintain through native language, customs, and ancestral dances. Modern seaside villages dot the shoreline. Tropical oak and evergreen palms grow in abundance, and you'll have many photography opportunities when scouting various indigenous flora and fauna along jungle trails in the 30 acres at Carambola Botanical Gardens. Mangrove forests protect the coastal areas and support diverse marine life. Local vendors sell colorful handicrafts, and I couldn’t resist buying a beautiful ice bucket and trivet, both constructed of a dozen different kinds of wood found on the island. Useful items like these are the best remembrances of a fun trip.